Independence has completed sea trials and is expected to sail to Klaipeda port by the end of 2014. The naming ceremony for the vessel was held at HHI’s Ulsan Shipyard. The FSRU features a dual fuel disesel electric propulsion system. Image courtesy of Klaipėdos nafta. Independence is the world’s first new-build liquefied natural gas (LNG) floating storage regasification unit (FSRU). It is built at Hyundai Heavy Industries’ (HHI) shipyard in Ulsan, South Korea, for floating LNG services provider Höegh LNG. The vessel will be chartered to Klaipėdos Nafta under a ten-year lease agreement signed in March 2012, which also includes an option for purchase. The FSRU, built at an estimated cost of $330m, will supply LNG in Lithuania. It was ordered in June 2011 and the first steel was cut in September 2012. It was christened Independence in a naming ceremony held at Ulsan in February 2014. The ship has undergone successful sea trials and will sail to Klaipeda Port to start operations by the end of 2014. Independence is the first of four FSRUs being constructed by HHI for Höegh LNG. The FSRU will serve Klaipėdos Nafta’s LNG terminal. Atlantic Mercy is Mercy Ships’ latest addition to its fleet of travelling hospitals. The LNG FSRU incorporates a double hull built of mild steel. She has an overall length of 294m, a width of 46m and a depth of 26m. 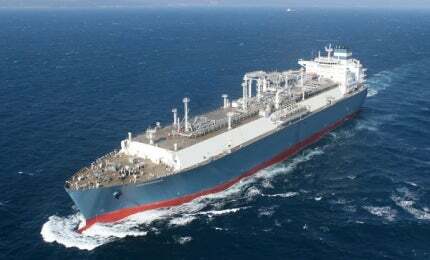 She has a maximum draught of 12.6m and capacity to store 70,000t of chilled natural gas. The vessel is of the Det Norske Veritas (DNV) class with a storage volume of 170,000m³ of LNG in thermally insulated membrane tanks. The LNG stored at -162° will be heated up to very high temperatures in the regasification system onboard the ship so that it evaporates to form natural gas. The gas will be then delivered to the vessel through pipelines to be supplied to consumers in Lithuania. It has a regasification capacity of around 400,000scf/d and is powered by a dual fuel diesel electric propulsion system. Wartsila Hamworthy was contracted in November 2011 for supplying the regasification unit to be fitted onboard the LNG FSRU. The propane-seawater regasification system is 20m long, 18m wide and 10m in height, and has an overall weight of 500t. It was delivered in the form of modules, including all the important process equipment installed for easy integration onboard the vessel. All the mechanical and electrical tests within the module, upon installation, were completed by Wartsila Hamworthy. The LNG terminal project, of which 72.32% is state-owned, is being implemented by Klaipėdos Nafta. The terminal is located at the southern part of Klaipėda sea port near Kiaulės Nugara Island. Construction works on the terminal started in 2012 and operations are scheduled to start in December 2014. "It has a regasification capacity of around 400,000scf/d and is powered by a dual fuel diesel electric propulsion system." It will receive and store LNG on the FSRU, which will regasify it to its original form, and supply to the main transmission system. The main components of the terminal include the LNG FSRU, a 450m-long jetty and associated facilities, and an 18km-long gas pipeline connecting the terminal to the gas metering station. The FSRU is permanently moored near the jetty to receive LNG from LNG carriers. Other facilities to be erected on the jetty include a high gas pressure platform, a servicing platform, mooring decks, berthing decks, communication bridges, observation towers, a control room, fire safety equipment, cranes for technical maintenance and high pressure gas transmission loading arms.